evolution of a pool, pt. 1 | . stephrything . So ... I'm also a singer songwriter -- stephanievaldez.com. This is the our landscaper's design, as if viewed from our house looking out. And a bird's eye view. We're working with Green Planet Landscaping, who subs out the pool itself to Laguna Pool & Spa. And here's how it's done. 04.10.12 Measuring and spraying the form. Digging the hole. Since we have a wide side fence, they knocked it down and brought in the big guns. 04.11.12 After digging less than two feet down, they ran into caliche: (wiki) a hardened deposit of calcium carbonate, which cements together other materials, including gravel, sand, clay, and silt. Which means they had to bust out the jackhammer at an hourly rate. Awesome. 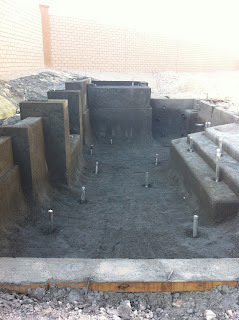 04.17.12 The pool is finally carved out. 04.29.12 Plumbing and gas lines set, after several days of placement. 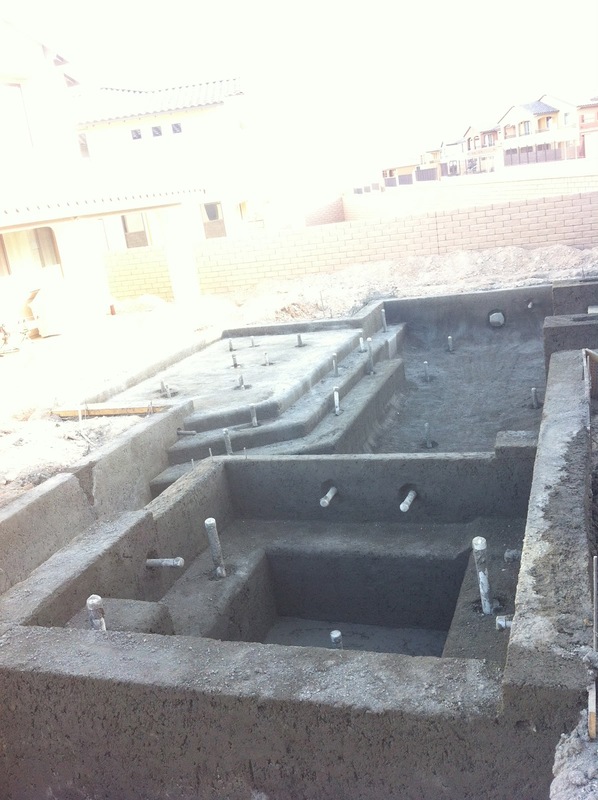 The gas line runs to our gas meter on one side of the house, and the plumbing runs to the other side of the house to our pool equipment. 05.04.12 Rebar placed over a few days. Electrical hookups also added. 05.11.12 Cement sprayed, aka. 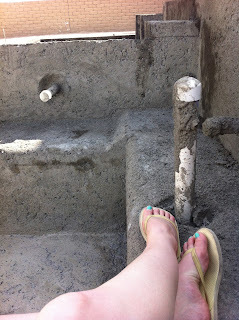 shotcrete. Later that day, the pool has form. Over the next several days, the concrete will set. And so I tried out the hot tub. 05.23.12 Forms for the decking placed (at first in the wrong spots, so they reset them this day). Also, previously the retaining wall in the background was dug out and started to be formed. And tiling continues (started earlier that week). 06.06.12 Hot tub tiling started, worked on again 06.09.12. Retaining wall finished as well. And that brings us to today, two months since we broke ground. Someday my pool will come. stephrything 2011-2014. Powered by Blogger.